Welcome to 7 Plus Minibus Hire in Luton, where we cater for all your group transport requirements. We cover Dunstable, St Albans, Stevenage, Harpenden, Milton Keynes, London and areas surrounding these locations. We’re a professional family run minibus company providing 9 to 32 seat minibus hire with driver at very competitive rates. Operating 24 hours a day, 7 days a week, we can cater for any type of event or journey at any time. Book online or call us today to reserve your transport. Our minibus Hire gallery is a great way to view our fleet so you can choose the size and type of minibus hire for your needs. We provide 9 seater minibuses for small groups or you can hire a 16 to 32 seater mini bus for larger group travel. We own and operate minibuses for hire and employ our own drivers. We are not minibus brokers, so cut out the middleman and book directly with the cheapest minibus hire company in the region. We have been providing low-cost minibus hire for London Luton Airport, Heathrow Airport and throughout the south of England for a number of years and with regular upgrades to our fleet and a growing customer portfolio, we are proud of our reputation. We will not let you down be it an early morning trip to the Airport or a late night return from a party or night out. Just request a quote using the form on the right or for more urgent enquiries you can call us. Our standard minibuses fleet vehicles are modern and custom made to carry passengers with comfort and safety. All minibuses have 3 point seat belts and drivers are professionally qualified to drive minibuses to carry passengers. Our Luxury minibus fleet consists of Mercedes Benz mini-coaches which have been designed and built by professional British coachbuilders. The design of each mini-coach is based on luxury and is very unique. The exterior is stunning and the interior is simply luxurious and includes features like air-con, leather seats, DVD Media Player & PA system etc. All minibuses are available in Standard and Luxury speech to suit YOUR budget and needs. Get a quote today and book early to guarantee availability. You can hire a minibus with driver via our online form, just click here. Once submitted we will get on it straight away (during normal office hours) and get back to you with a tailored quote. Please enter all the details and additional information if required in the field provided. Once booked, we will usually take a small deposit so your minibus is reserved and the balance can be paid when you travel. Our returning customers are a testament to the service we provide as reliable and low cost. You can rest assured we always strive to achieve the highest standards. And with easy to pay options available booking really is as simple as 1-2-3. We do not charge extra for late night travel or bank holidays. Feel free to call us any time of the day to ask any questions about minibus hire for Luton, London, Hertfordshire and Buckinghamshire. 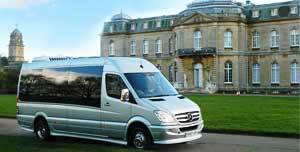 For Minibus Hire in Luton, we provide cheap minibus hire with driver. Whether you travelling locally or to an event, at minibus hire Luton we refuse to be beaten on price or quality of service. Available for hire 24 hours a day 365 days a year. Luton, Dunstable, Luton Airport, Bedford, Harpenden, St Albans, Hatfield, Leighton Buzzard, Stevenage, Hitchin, Letchworth Garden City, Toddington, Houghton Regis, Bletchley, Milton Keynes, Hertfordshire, Bedfordshire, London, Stansted Airport, Heathrow Airport, Gatwick Airport, London City Airport, Walkern, Knebworth, Buntingford, Welwyn Garden City, Baldock, Henlow, Shefford, Stotfold, Sandy, Biggleswade, Flitwick, Kempston, Newport Pagnell, Hertford, Ware, Hoddesdon, Potters Bar, Radlett, Hemel Hempstead, Royston, Borehamwood, Arlesey. For group travel when comparing car hire, van rental or minibus hire, an 8, 9, 12, 17 or 17 seater minibus will provide the best value for money. Seven or more people travelling would also require the hire of at least two cars. Van rental would obviously not be practical so the minibus option is the way to go. Even taxi hire would cost more than renting a minibus. Used 7+minibus for Milton Keynes Theatre last night. Brilliant service, very nice driver on time. There were 7 of us, we will definitely use them again.